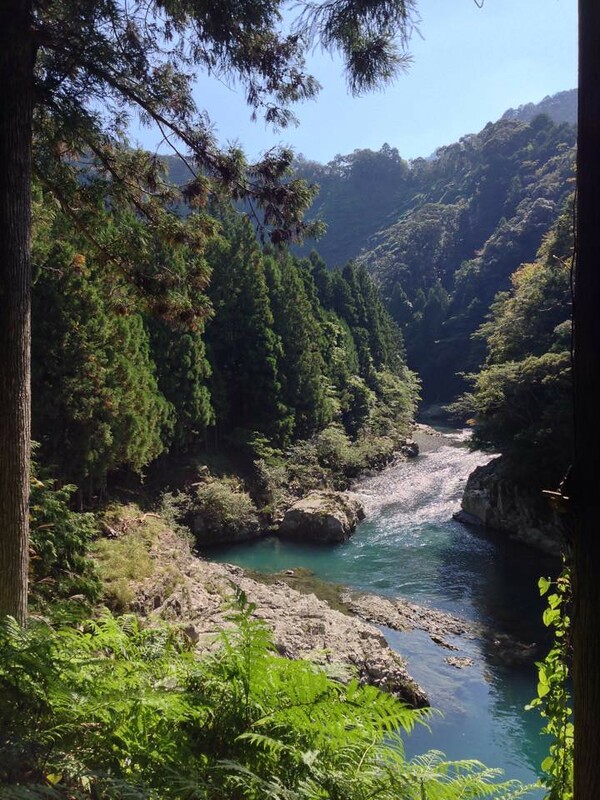 Middayish – 7pm was just a short jaunt through Tokyo and up the Tohoku Expressway to Kitakami, Iwate prefecture. Why the midday start? Well, last year I set off after dark and arrived up north at 3am. That cost us with a late slow start the following day. So, decided to sleep well the night before, have a slow hearty breakfast and give myself enough time to triple check everything before sailing out of town. Everything was there, including the street pants and shoes I’d forgotten last year. Oh, and the lip balm and decent tankbag rain cover. Thankfully, the ride north was a smooth, uneventful run. No budding tornadoes or freezing rain. Just a great welcome to Tohoku! 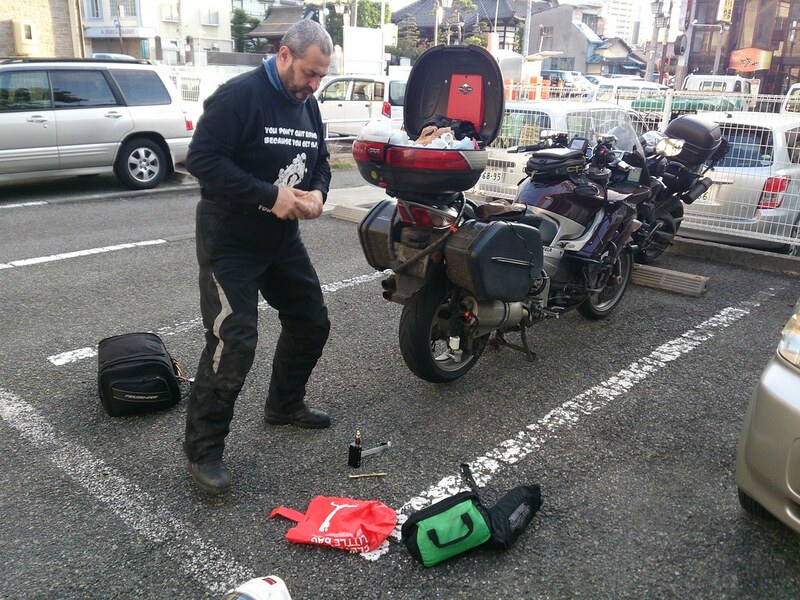 James was out enjoying the jewels of Tohoku all that day and rolled in a little after me. It was good to see him as that meant this ride was certainly ON! The FJR, FZ1 – End2enD road runners back on the road again! 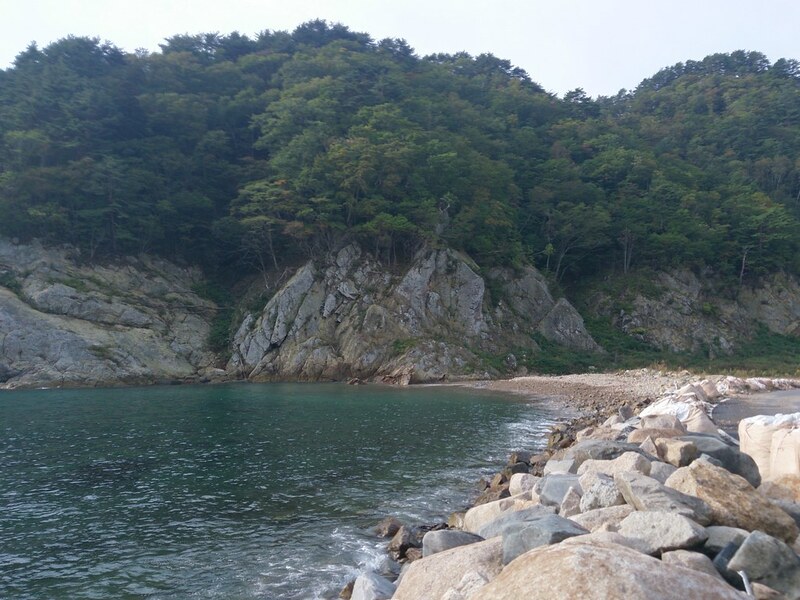 Stayed at Hotel Montien in Kitakami. 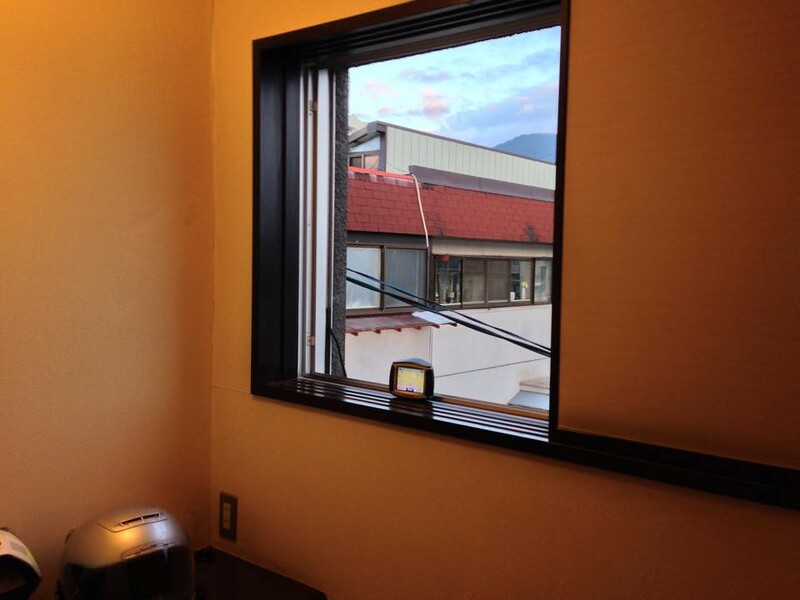 Clean, modern and had a great top floor onsen with outside rotenburo. The room was different with there being no door between the wet and dry areas. Yep, one could sit on the toilet and watch TV should they be inclined to do so… Actually, could watch the whole room! 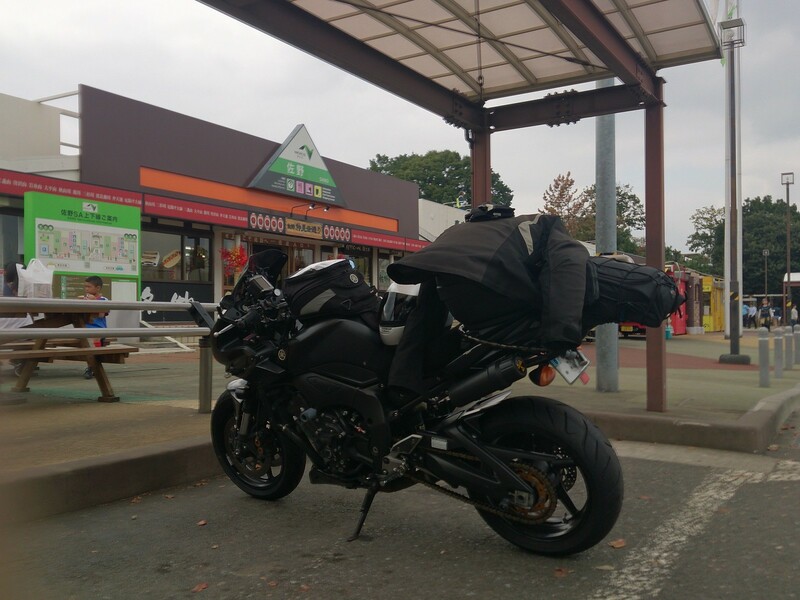 Good: Got 9 hours of sleep and was very relaxed and so stress free and hyped to be rolling for the week with great roads and a TOP wingman that I actually enjoyed the 635km of mostly expressway to Kitakami. 5:30am – 8pm, a long day running east, north, west and then generally south into the approaching Typhoon Vongfong, the strongest storm to hit Japan for the year! 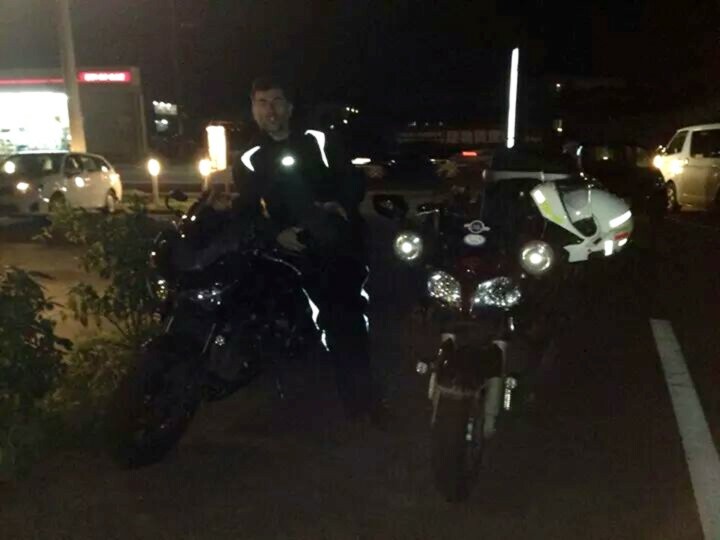 Was great to be trudging into battle again, givibox, tankbag, rearbag and helmet in hands through an empty reception out into a dark dewy carpark. Nope, no breakfast for us polite little reception lady, we have a road to conquer! Started out with a flowing run to the Pacific under a brightening dawn. About 2/3 of the way there the sun crested the horizon on a fantastic clear cold morning. My temp gauge was showing 7-8℃ and it didn’t change till nearing the coast. 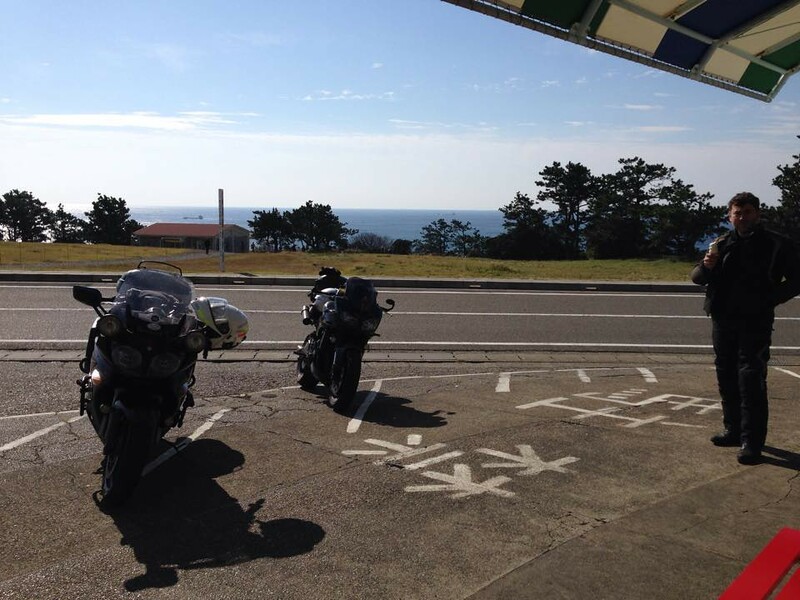 We weremaking good time and enjoying the lonesome roads until Kamaishi where traffic picked up and we rode into the tsunami zone. 4 years later and it still stumps me. Sure the rubble we saw in 2011 is gone and nature has laid a green blanket over the scars, but the bones still jut and haunt under that delicate regrowth. Peeled off rt45 at Yamada and followed the bay round on 41. 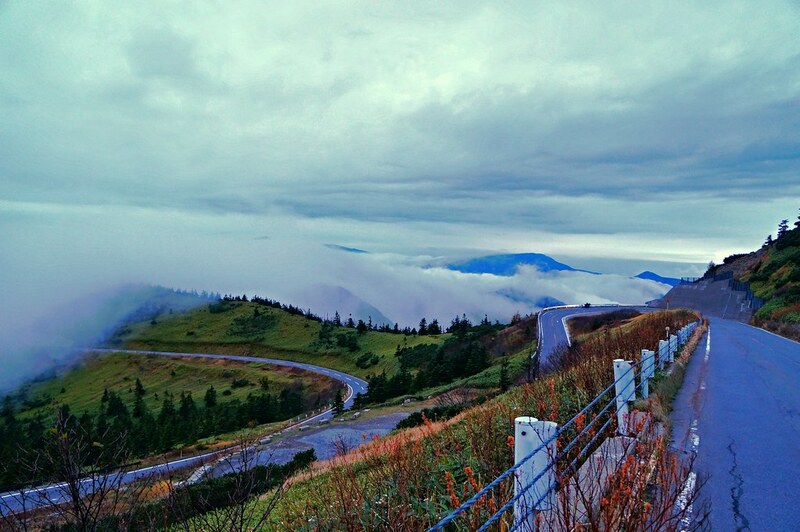 That road! 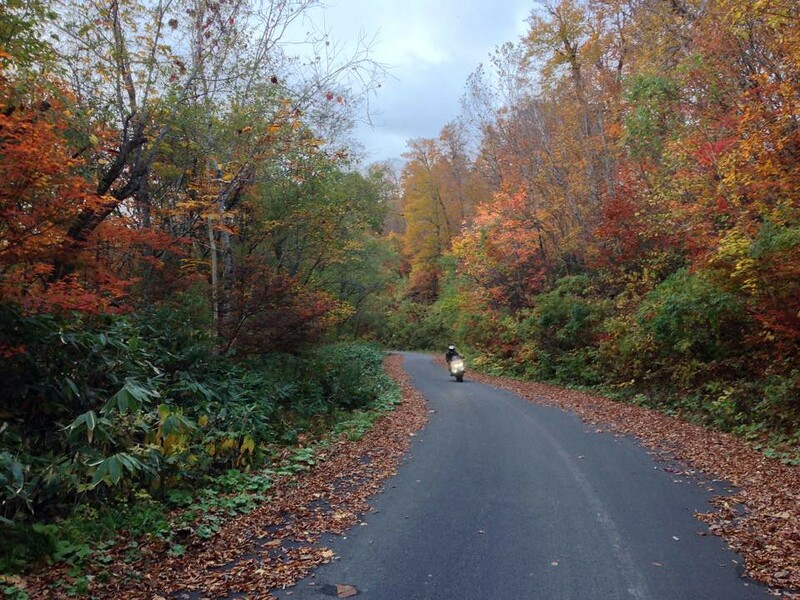 Best road of the ride yet and able to pull any rider out of the duldrums. Even James and his laboring FJR. 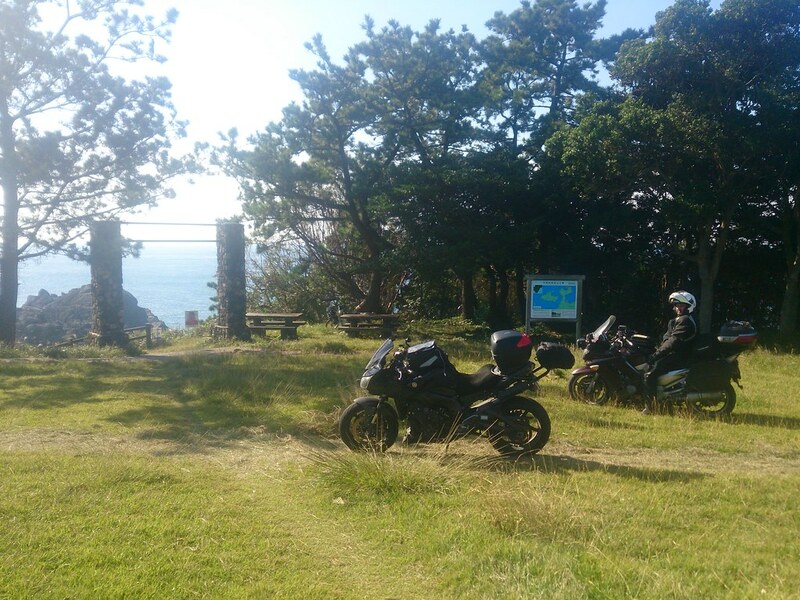 We had a ball rockin and rollin up to the turn off for the little road that takes you down to the bay for the trail out to Todogasaki. Boy had that bay changed! The fisherman had a boat-lifter again and the large debris was gone. 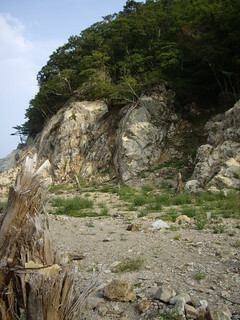 But the scarred rock walls are still there. Here’s the same rock wall but from different angles and 3 years apart. Good to see the debris was gone and there was some sense of normalcy in that area again. 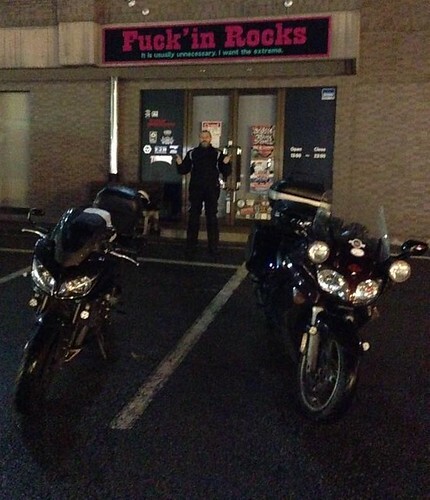 Anyway, we were there for one of the 4 corners, Todogasaki. 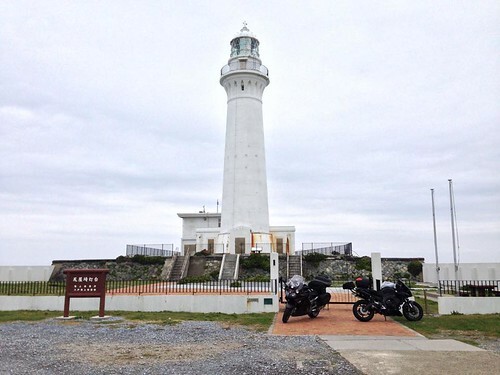 It’s a point with a lighthouse some ways up a trail and well…we are more the riding type than the pedestrian type so made do with a photo of the bikes by the sign at the entrance to the trail. 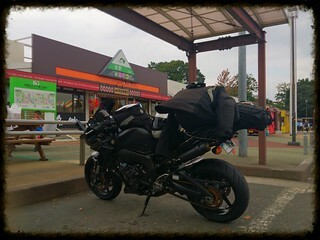 Back on the road, we soon stopped for our 1st combini breakfast. 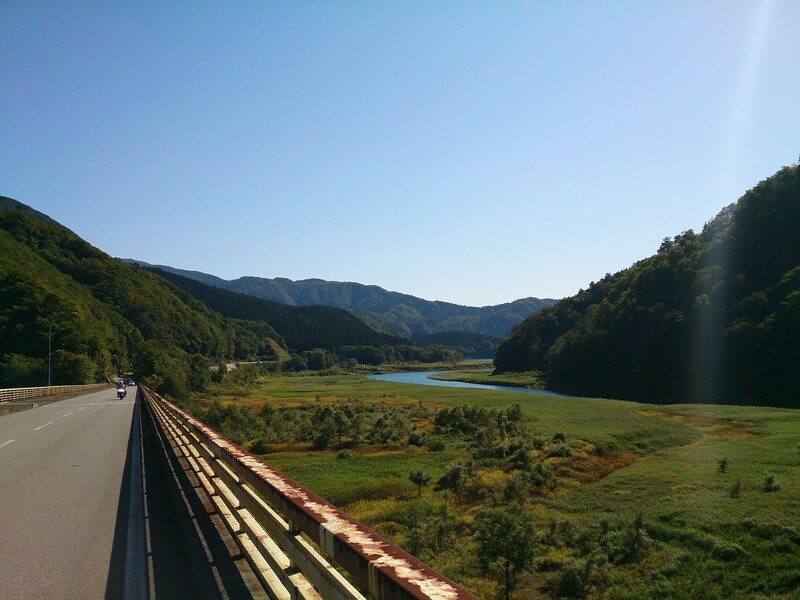 While there, we met a young enthusiastic biker and his mum who was also once an enthusiastic biker, even toured Hokkaido and Kyushu! She’d passed the torch apparently. After they left, we were admiring the FJR’s ample road grime camouflage. 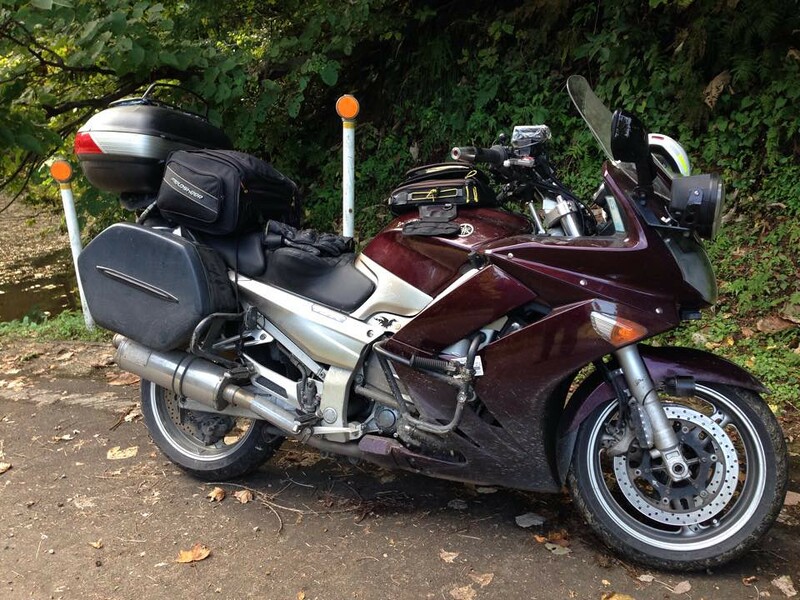 Like barnacles on a world-wide seafarer, the FJR had its cling-ons. 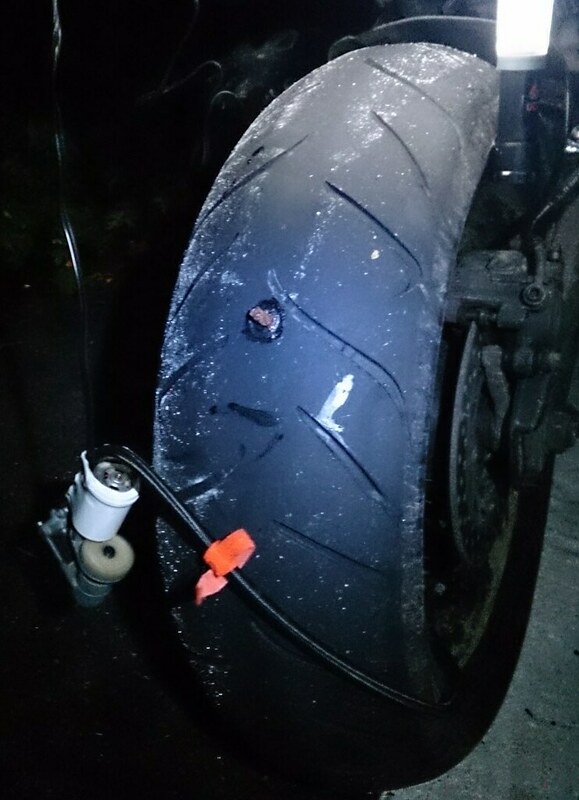 1st repairs of the trip… and look at all that rubber on the rear tyre! Also happened to notice the FZ1 was as yet bare of barnacles and also missing an exhaust bolt! Next stop, fuel then a homecentre. 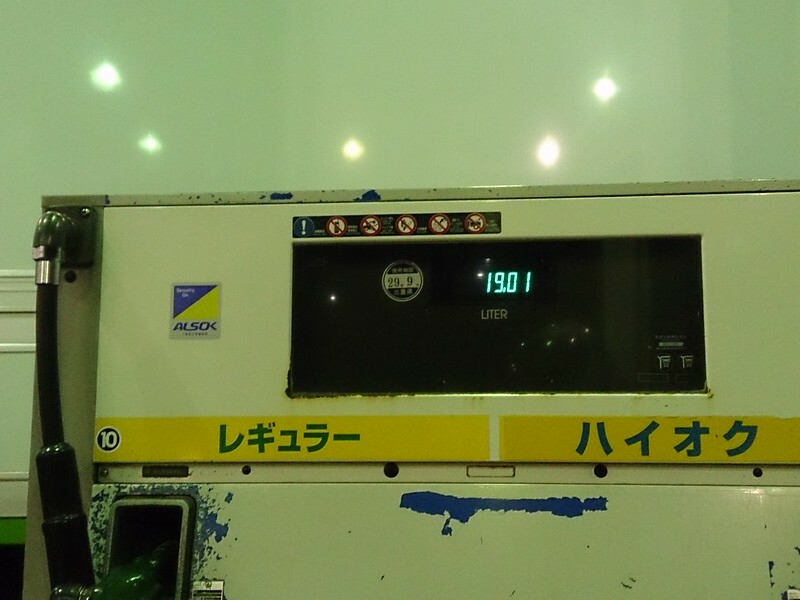 Found a self-serve just before Miyako, topped off the tanks and got to top up the auxiliary fuel bottle refused the night before. Then, back-tracked a couple blocks to a homecentre we had passed. They had just the stainless hardware needed and soon we were on the road again headed north. 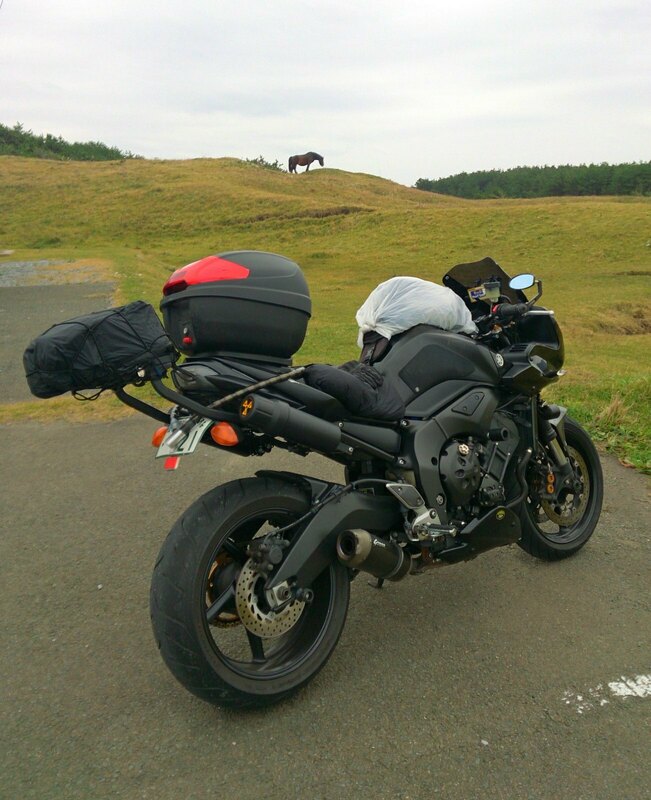 Sailed by Hachinohe, thru farmers fields around Misawa and by a nuclear power-plant on the way to Cape Shiriya and its wild horses. 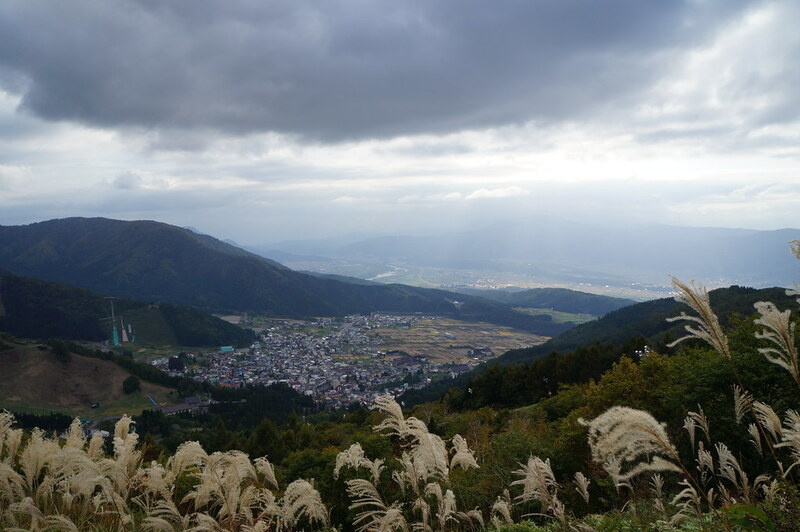 The weather was getting overcast with the typhoon approaching but there was no rain or wind, yet. Just a few spits here and there. 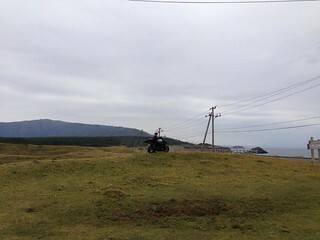 Leaving Cape Shiriya, James went on ahead as I cleaned my visor and got prepped for rain. The roads were straight and flat in that area and I was looking forward to chasing him down. So, I took my time 🙂 and somewhere before Mutsu, gaining rapidly on J and tucked behind the screen, scanning cross-roads for obstacles as they passed, I completely missed the one crossroad with a thumping big crown that went straight across the roll of warp line I was on. I remember the tank bag thumping me in my chest, being able to see my front wheel under me and looking under me to see my left foot float down and brush the outside of my seat before plonking back down in the saddle. No tank slapper, sliding, grinding or any nastiness. Just an unexpected low level temporary orbit over Shimokita Peninsula 😮 Pulled over to check fork seals, shock, that everything was still attached and that my pants weren’t packin heat. 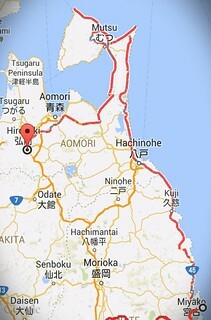 All was good so on to Osorezan via rt4. Rt.4, yeah baby, yeah! Osorezan – James the gate-keeper! Then it was onto Oma and our North Corner. As the rain started to spit again and the night sky was falling, we fired up for the long haul down to Hirosaki. Had a good run with minimal traffic and no delays. 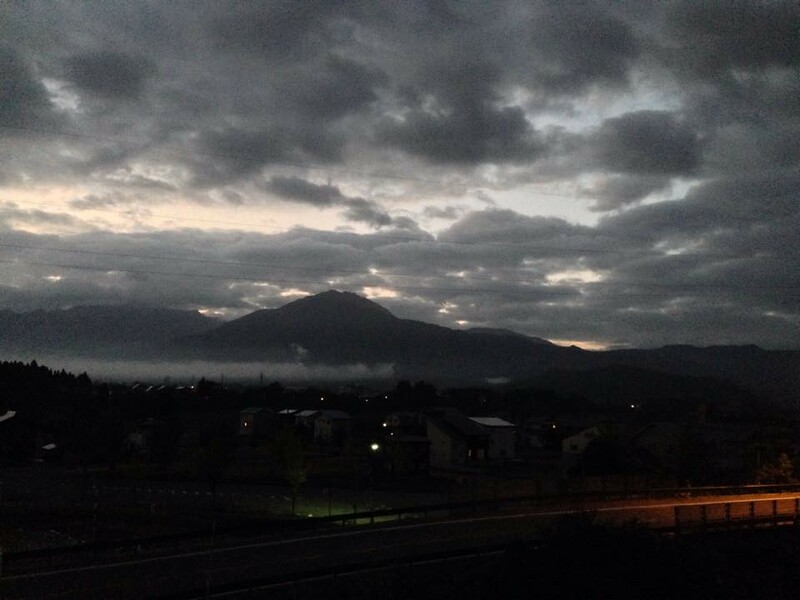 Halfway along the Michinoku Road, the rain started and by the Aomori Airport, it was clear the typhoon had arrived. Luckily the hotel was only about half an hour away and not 2 minutes after pulling in, the heavens opened. Great timing! Yep, double thumbs up for a great day! Good: Eastern and Northern Corners done! Saw some horses, went off-roading and it’s all south from here. 11am – 4am, a looooooong day-night that started waiting for the weather gods to finish partying! Woke at 6 to a miserable morning of pouring rain. Woke again at 8 and it was looking even worse! So, went downstairs for a leisurely breakfast and only 5 others were in the restaurant. 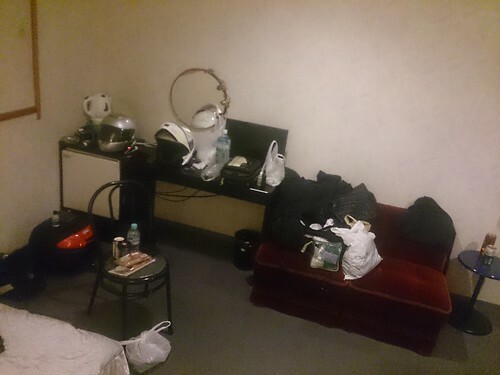 Seems the typhoon had the hotel near empty. Watching the weather on the TV news in the restaurant and the typhoon was right on us at 8:30. All the weather reports were showing a tailing off after 10 so we foraged the food counters and settled in for breakfast and lunch. All those TV live weather reports looked quite lame. We got talking and figured on giving it a try. Why not? We had better helmets! Went out front at 10 and the rain was well… still falling and the road was waiting. So, nothing for it but to get rolling. But 1st, James had to feed the FJR. J: Here you are you greedy b#st##d! FJR: Give it to me Jamesy! Uh-huh Uh-huh! It was developing quite the appetite for oil and getting all kinds of sketchy between hits, causing James all sorts of problems. Like what? Well, how about not being able to close the throttle as it would stall if you did. Just think about that for a bit…. Ok, you considered traffic signals and having to clutch in-rev up and brake all while coming to stop, right? Fun fun fun! Now, did you factor in downhills? Hairpins? Debris? Blind corners? Mmm, sounding nastier by the question isn’t it? 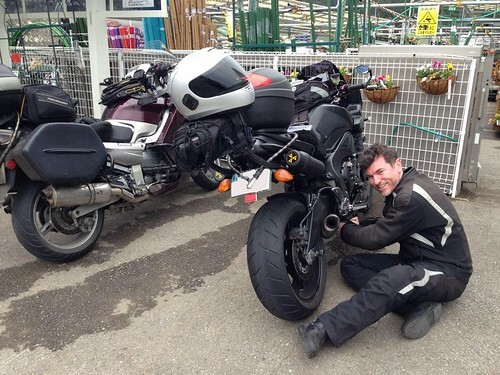 He’d been running this juggling act for quite some time it seems and now things were getting worse as the FJR was hooked on the good oil and demanded fresh stuff regularly without giving James any respite. 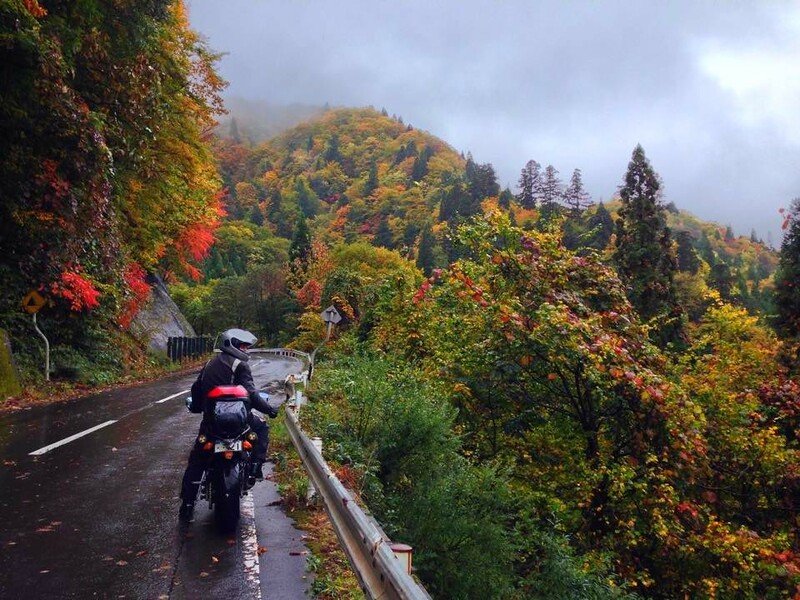 Now we were riding into the tail end of a typhoon on slick, debri strewn mountain roads… he’s a brave fella that James. All lubed up and bags wrapped for rain, we hit the road. 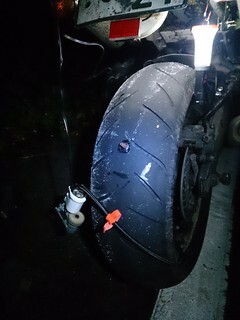 First tasty licorice strip, Sakunashi Touge Rt.282. But, the typhoon had beat us there. And the debris continued all the way up through Hachimantai along with a steady rain. 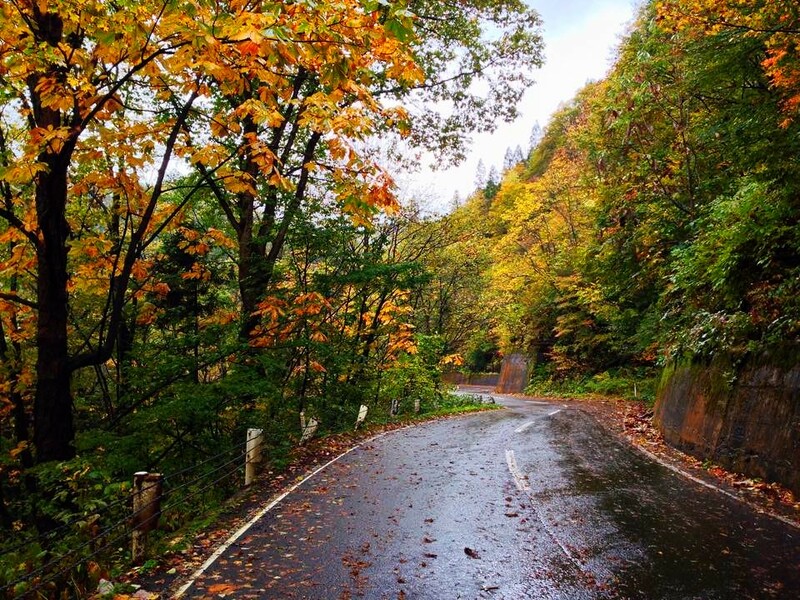 But the rain was easing and holes started to open on the run down to Lake Tazawa. Even with the rain easing and blue skies growing more common to the south, it wasn’t a shade on last year. To be honest, we hadn’t had such a rockin ride so far but it was improving with the typhoon throwing itself into the northern Pacific and the roads drying out. 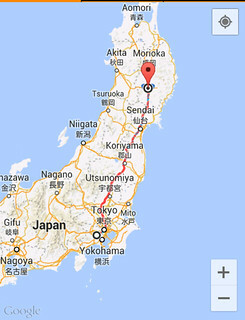 All that aside, or behind us, we had planned to be in Niigata for the night which was still a ways away. How far? 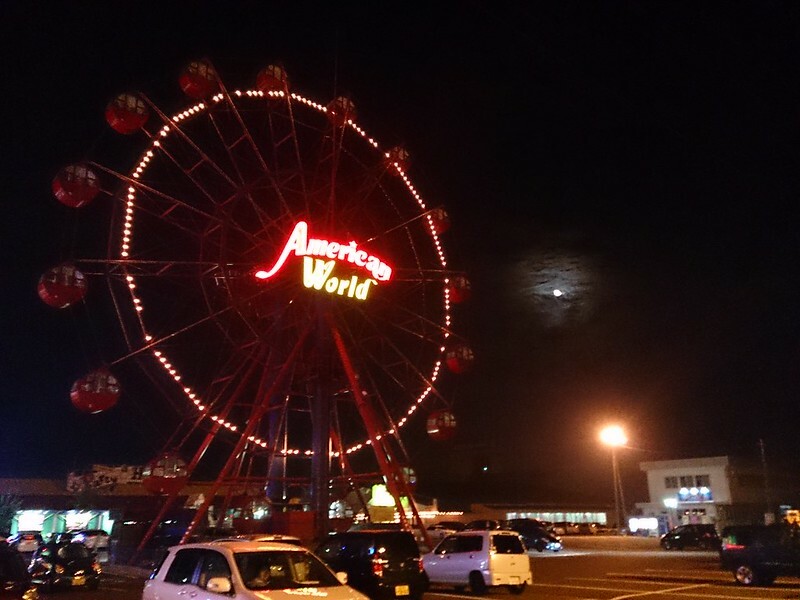 Well, we still had Miyagi, Yamagata and Fukushima to get through and all at night! 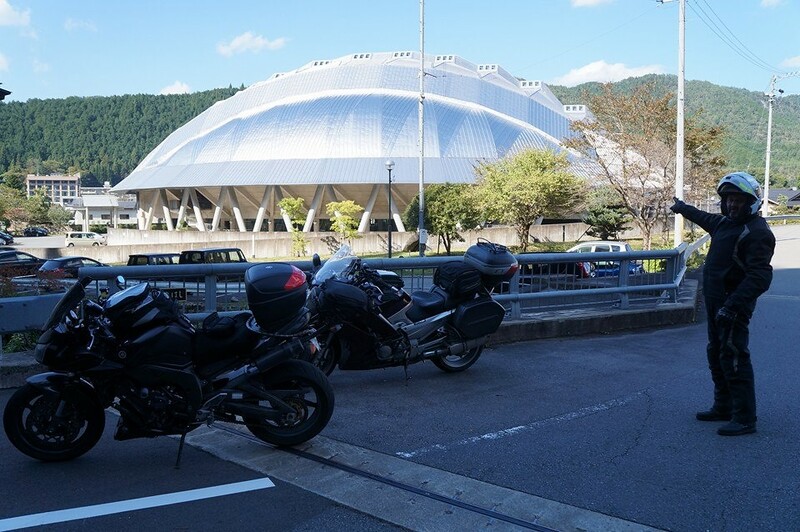 We had a great run south from there and by the time we rolled into Yonezawa it was time to refuel both bikes and riders. The bikes we fueled together but then we got seperated. 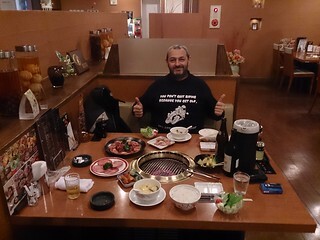 We’d agreed to stop at the 1st combini or family restaurant. I was tired and totally missed the 1st one. Stopped at one several km down the road and gave J a call. He was feasting and I wasn’t going back. A little while later J rolled up and we were on the road again headed for Kitakata via the Otoge Road (121). 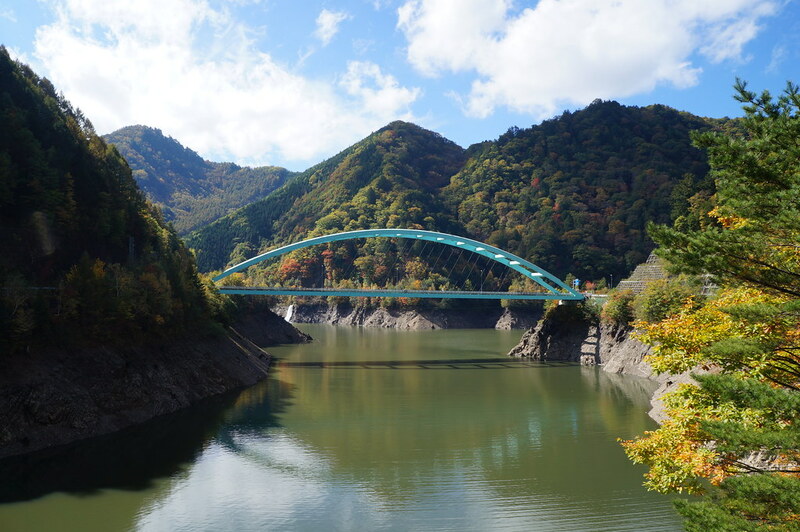 One can cover a lot of distance on the Otoge Road as it is wide, winding and fast with a bunch of tunnels punching holes through the mountains dividing Yamagata and Fukushima. It does have its tests though. Trucks use it quite extensively and have left their mark with deep tyre grooves. It also runs through the mountains with all the associated wildlife. 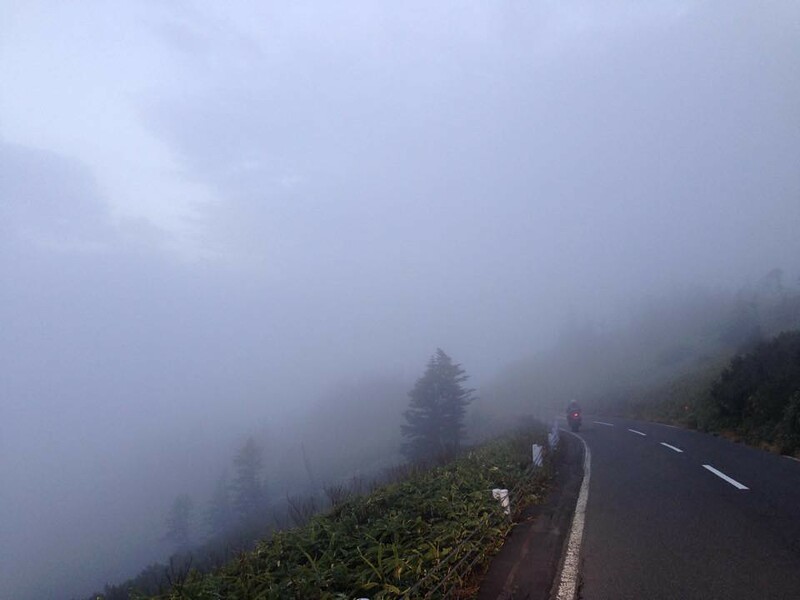 Now, add the conditions that night – fog, thick fog and one decent shower. The shower filled up those grooves hiding them causing random tyre wanderings, just the thing for riding in the fog with trucks coming the opposite way… We survived that. 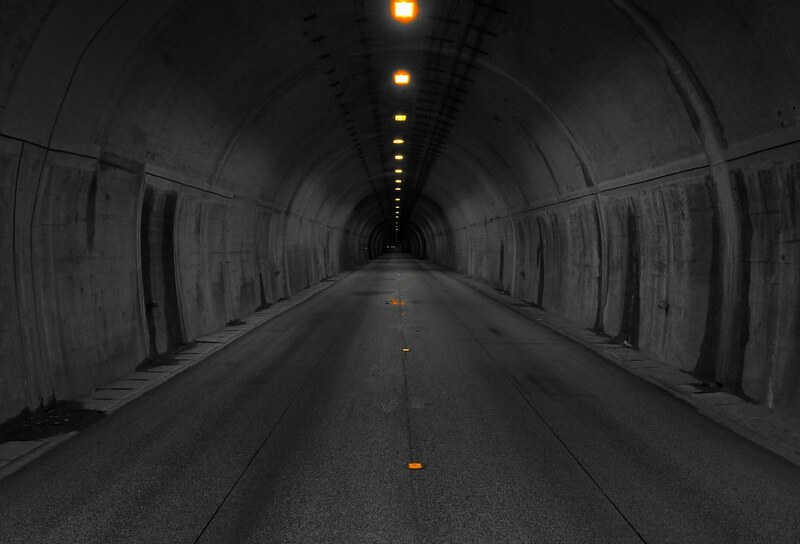 Thrived in the tunnels and made our way down to Kitakata on a clear and smooth lower section of the 121. The tunnels were a great blow dry and a chance to stand up and stretch out. The whole lower section was also a little less stressful for James and the dying throttle on the FJR. He was struggling but putting in a good effort. Certainly seemed taxing on him though. 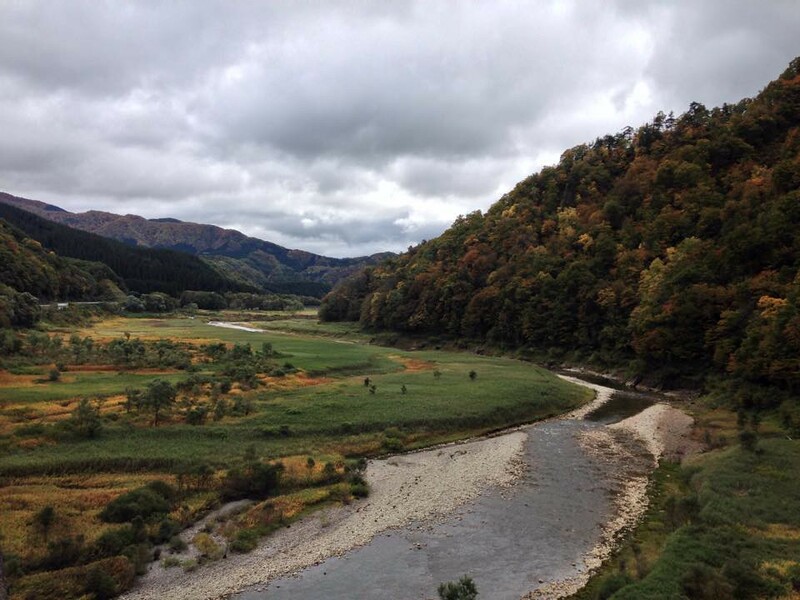 From Kitakata, we made our way around to the Tadami River and followed it down to the Numata Highway (rt252) where they meet and dance, crossing paths, for the following 70km all the way up to Lake Tagokura. In the dark, we were wary of wildlife and fortunately didn’t see much until… about 1/2 way to the lake, a weasel ran into a tunnel ahead of James and made the wise decision to jump on the sidewalk to watch him go by. He even stood up on his hind legs as the FJR rumbled past. Then he made a silly decision that brought him and my front tyre to blows. 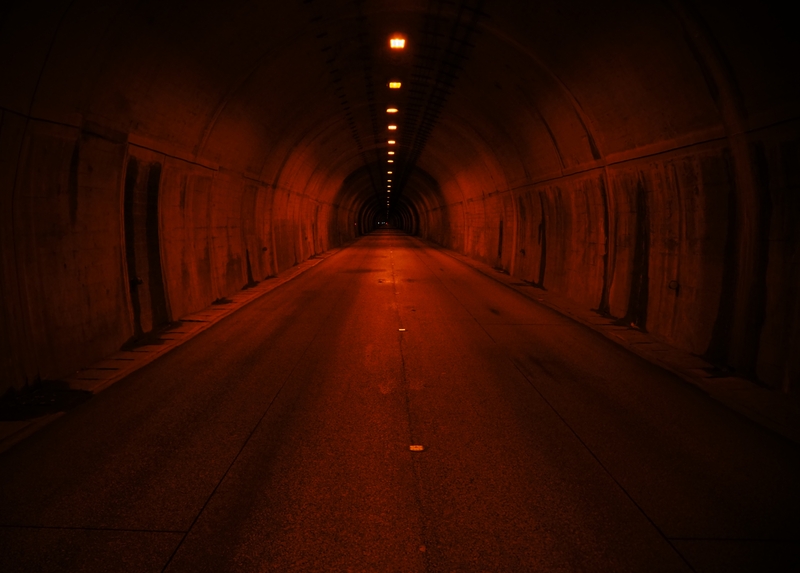 I turned around and lifted it off the road, setting it on a ledge overlooking the tunnel entrance and forest down to the river. I hope it rests well there. 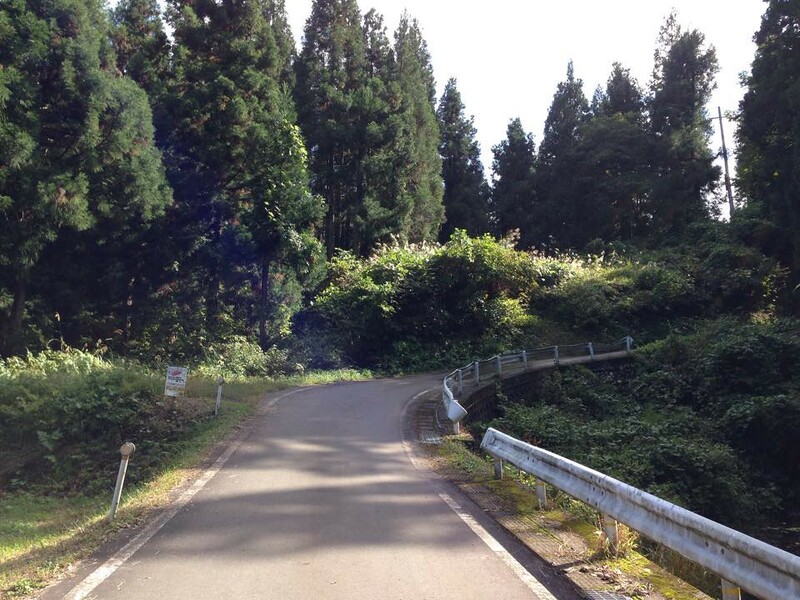 Back on the road, I caught up to James just as we started the climb alongside Lake Tagokura. A nice climb with clean smooth corners leading to some covered semi-tunnel corners. The concrete kind with holes between pillars were the wall should be on the open side. During the day they offer nice views. That night I was enjoying the sound of my exhaust bouncing around in the concrete, getting a bit lively and then, hey I’m drifting a little. A little more throttle, a little more drift. 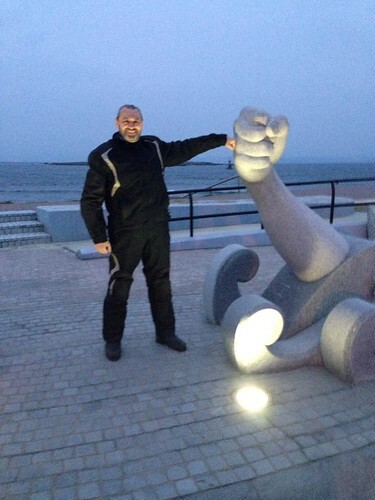 Left – right – long left, throttle, drift and right, off throttle…still drifting…huh? Slight weaving from the rear.. ahhh, I know this feeling, a puncture. Damn! Bad luck or karma from the furball a ways back? In any case, it was around 10:30pm and I’d pulled over with a really flat tyre only a few corners from our mountaintop planned rest stop. James was soon there and we got to work. James pulled out the light and his puncture kit. I, the compressor, headlight and my puncture kit. While I was hooking up the compressor, James got to plugging that hole and it was a gaper! The hole filing tool slipped through without a struggle. 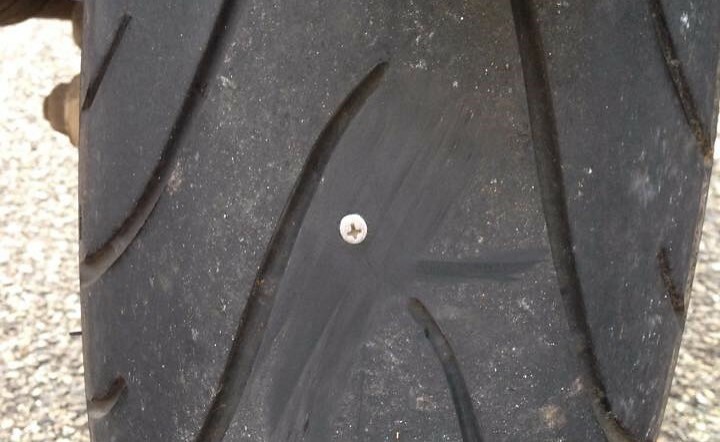 As there was a ring around the hole the size of a screw head, it must’ve been a decent size screw. The good thing about the hole was that it was perfect for plugging with minimal boring. The waiting was all on the pump. It took its time but did the job without fuss and James was quick with the tyre pressure gauge to get it just right. Cheers J! Oh, if you get a puncture on that hillclimb late at night remember trucks haul up the twisties trying to keep up the momentum and won’t see you. Actually, probably a good tip for any well trafficked similar road. Rubber ready to rumble again, we made our way to the top of the climb. 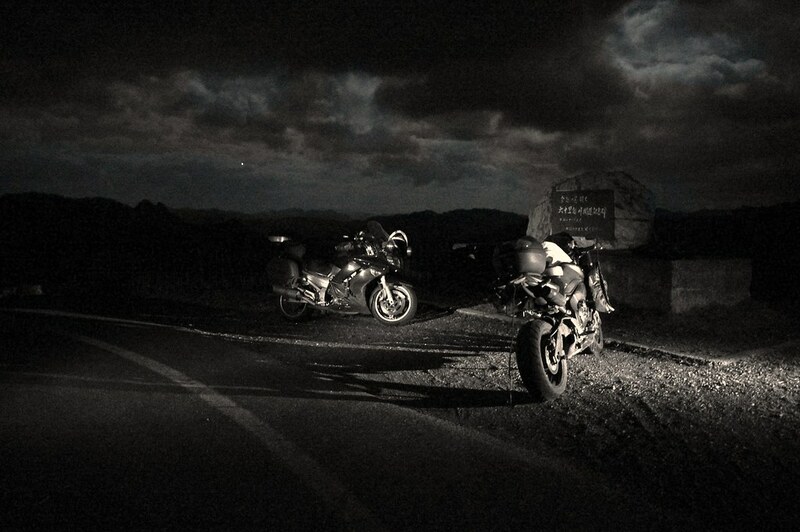 It was after 1am and we still had 60km to go. So, we headed back down toward civilization. Around 3’30am we rolled in to our hotel, Hotel Paramount Urasa, drained and ready for a good kip. James took this snap before collapsing. 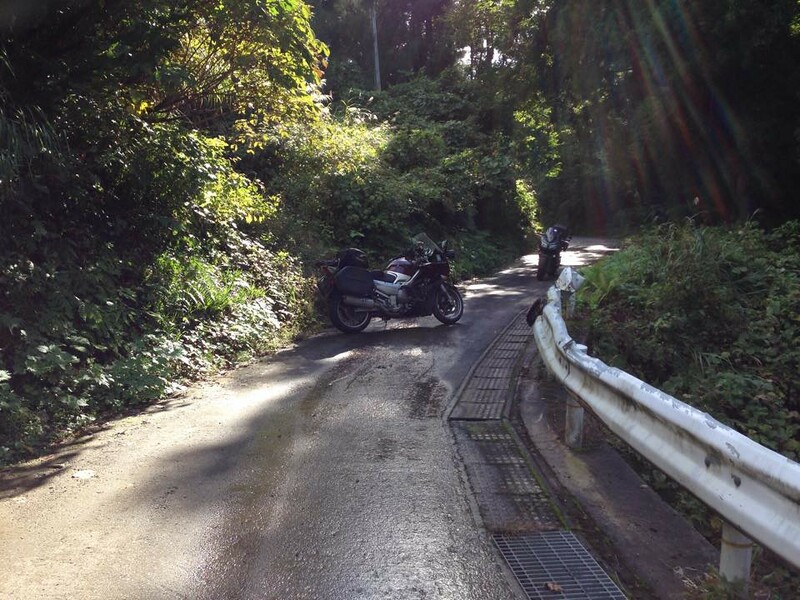 Good: Typhoon is gone. Managed a full day plus some. Bad: The FJR is giving James more grief. Laaaate finish. Roadkill. Puncture. Fairly tired. When the sun is rising as your eyelids are falling after a loooooong day of riding, you know the next day isn’t going to be a long one. But, even with road-ringing ears, not having showered and just over 4 hours of sleep, it was day 4 and traditionally the day I first feel right at home on the road. Even with little sleep and a late start, the pack-up was fast and without hiccups. Swinging a leg over and dropping back in the saddle had me feeling right at home. It was 10:30am and our 1st stop was an epic 200m away for a feed. That done, we rolled another couple hundred metres or so down the road to feed the steeds, lube the chain and puffed up the tyres a bit. All this prep takes time and near on midday we finally hit the road! 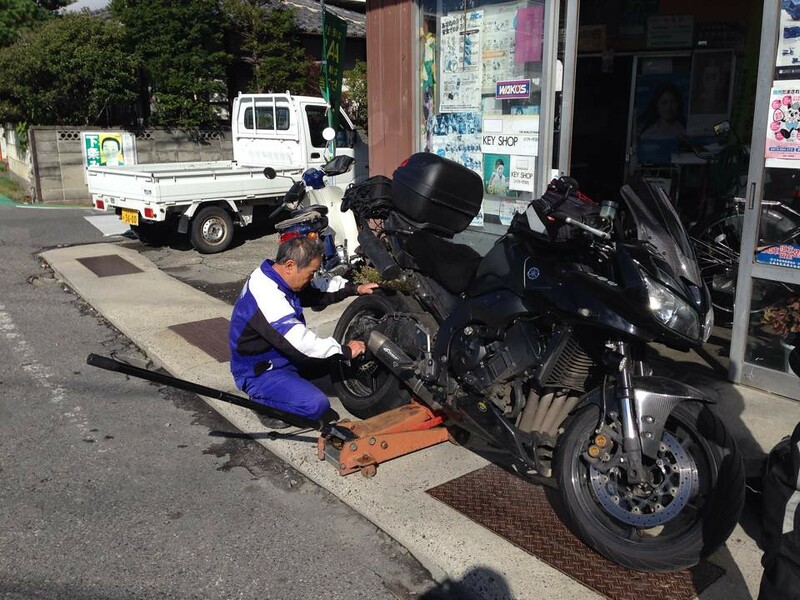 A bit of puffing and cursing later and the FJR was rubber side down once more. James always dresses for the worst and thanks to it, came out relatively unscathed. His bike is similarly equipped for and the crash bars did their duty and NOTHING was broken! A touring peg was turned, bolts bent and some scrapes here n there but the mighty FJR was still in it! Sure was getting cold as we climbed though. The 502 starts in the north at @325metres and peaks @1550m before sailing down to join the 471. It sure was cold up there even though it was the middle of the afternoon. Guess it is worth noting these roads close from late November till late May due to snow. 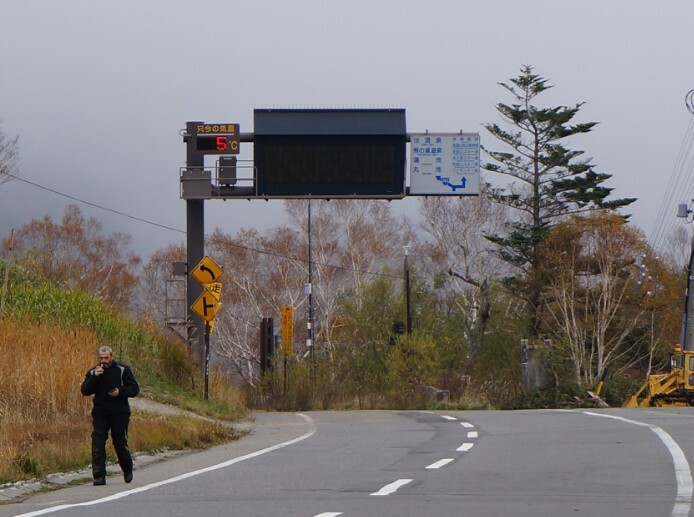 471 kept us winding along to the 292 – Shiga-Kutsu Doro and our highest and possibly coldest road of the trip. How high? Cold enough! Without heated gear we didn’t hang around. The sun was making for the horizon which gave host to some amazing views from the top of the world as the clouds rolled through. We found the 292 closed at the junction with the 466 so, in fast fading light, had to take the road less traveled down out of the cold. The Manza Road. It’s a fun hillclimb and has some fantastic views but a hard downhill slog in the dark on littered uneven roads. 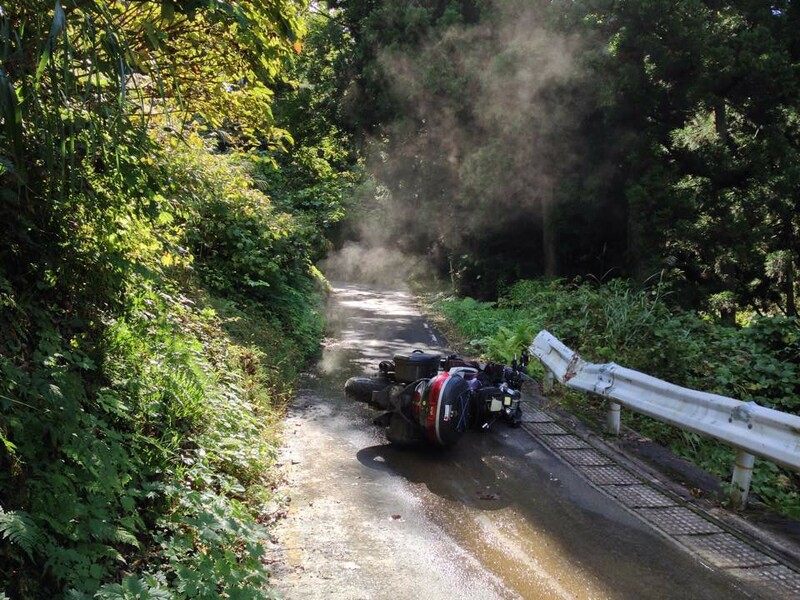 It was here I started to notice a strange sound…the sound of a loose chain eating a swingarm on engine braking. So, it was time to drop it into neutral and glide. I didn’t have the tools for a roadside adjustment. I had it easy as I’m sure James was being tested once again. All that braking and turning wears one out and when the junction of the 112/351 came up, it was time for a break and wait for the tested one. Sooner than expected he rolled in grim but kickin. We started to make some calls for the night’s accommodation and everywhere nearby and in our budget seemed full. 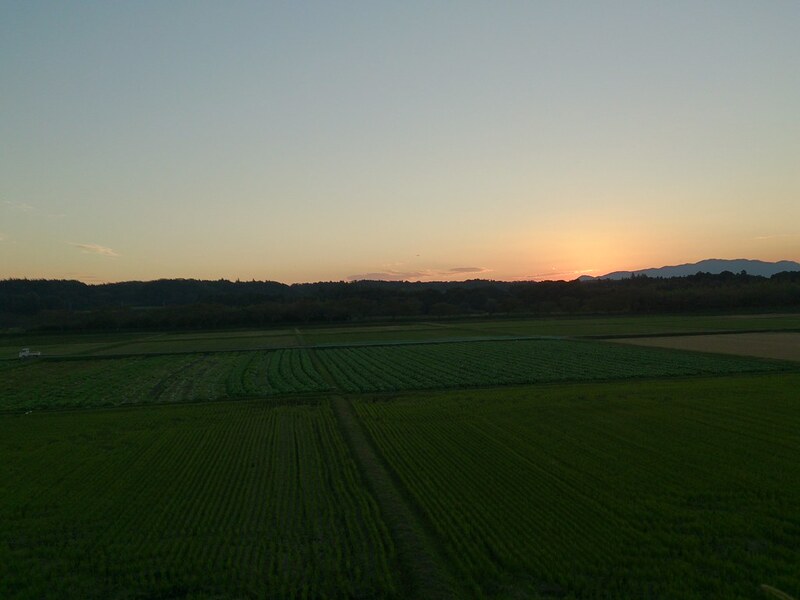 There was one place but it was in central Nagano city and not really where we wanted to be… but that’s where we ended up and a perfect fit it was. The old guy running the joint had moved his car and given us his space which was visible from our room. It was on a shopping street with plenty of eateries and we settled on a popular ramen place to refuel. But before we headed out to feed, James went all domestic and used the hotels facilities to do some washing! The guy never ceases to amaze. 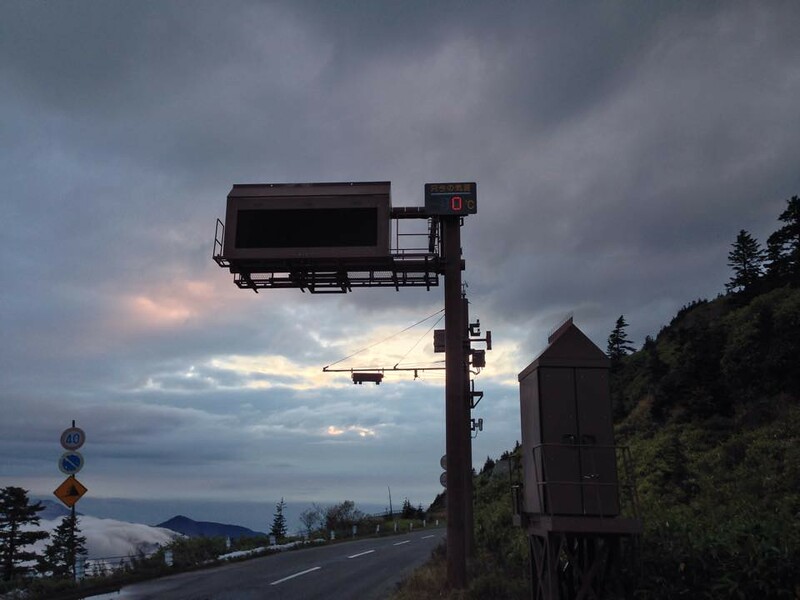 And as to his test…he was tested and found not to be wanting for anything but a smooth running bike and clear roads. Good: James! Blue skies, dry roads, early finish and good relax. Don’t jump Navi! Today will be better, I promise! We woke up refreshed and early ready to be on the road by 6am. Lugged the gear downstairs, loaded the bikes and then…dum da da dum dahhhhhhhhhh! J crabbing around like he’s packing heat. Something was givin him the sh#ts! J made short work of it. Topped off the FJR’s oil and we were on our way south on rt19 Azumino bound. Soon though, the chain started reminding me it was keen on devouring the swing arm. So, refrained from all engine braking and started scanning for a shop to pitstop at as I’d forgotten the monster rear wheel nut spanner. The 19 was a good winding run until Azumino where the traffic kicked up. Would have been good to jump the expressway down to Matsumoto right then but expressways are a no-go on this ride, remember. So, we laboured along. Actually, it was easy enough for me but traffic wasn’t doing J any favours so we decided to pull in for some breakfast and break the slog in half. Fed, watered and ready to roll, we got back in the rat race. On the jump from the 19 to the 147 somewhere in the backstreets, we buzzed by a local scooter/bike place. Cool old Yamaha loving guy there who was on the job in no time. Pushing 9:30, it was time to make tracks. And we did! 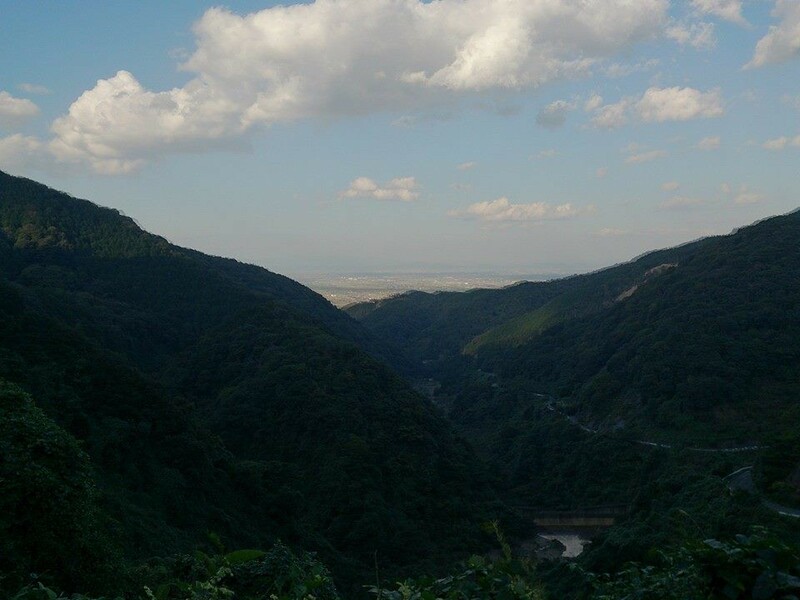 South to the 158 west out of Matsumoto snaking alongside the Azusa river down to the Azusa dam and our turn-off onto rt26. The colours were visible in the mountains, just where we were headed. Our first decent hillclimb for the day, Nomugi Pass taking us out of Nagano and into Gifu on rt39, climbed from deep greens through all the autumnal colours and up vistas with ever deeper valley views. The temps fell as the altimeter climbed. 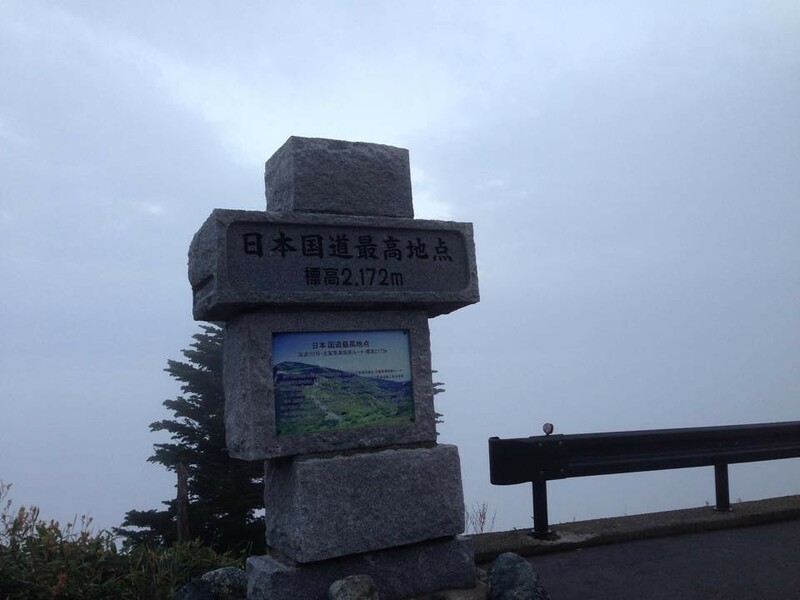 5℃ around the peak, @1650m. There were a fair number of people milling about at the peak of the touge were a trail ascended further up the into the barren forest. May have had something to do with Mt. 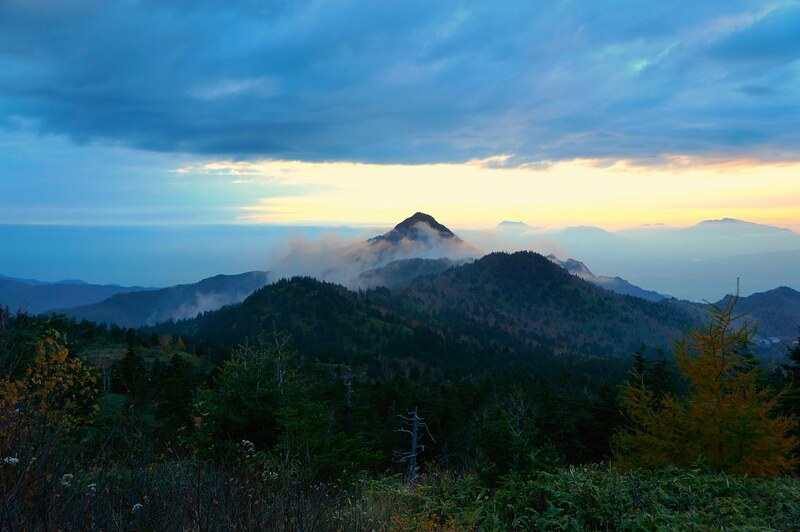 Ontake’s eruption a couple of weeks before. Not really our cup of tea so over the touge we sauntered. Descending back into warmer temps was welcomed. 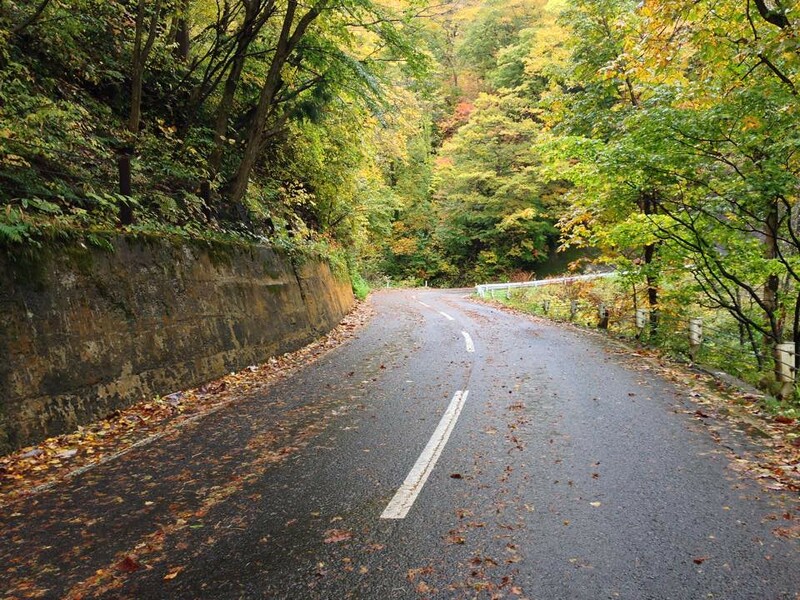 Being a great road made things easier, too. And just when I thought we were as far from civilization as we could get, we stumbled upon a UFO! Not long after we rolled into a T-junction with the 361 and it’s bridges. James and his bridges, he just can’t resist. 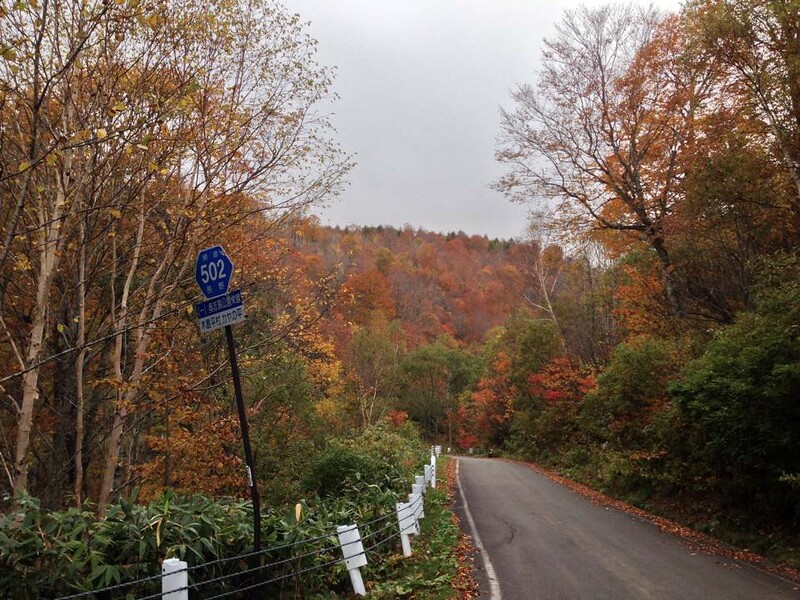 The 361 with its rolling roads winding through the mountains really encourages progress. The roads after were more of the same and kept us trucking. 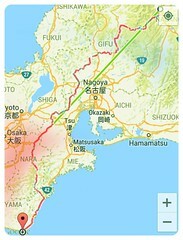 87, 41 then the wormhole like 256 which had us hoping west then south down into the relative maelstrom of Nagoya. I’d endeavoured to plot as lower friction passage as possible through and around the urban jungle and for the most part it worked out. Especially the riverside rt261 with it’s lack of traffic lights and clear views from the cap of the flood embankment making overtaking a breeze. Speaking of breezes, it actually got hot enough that at a traffic light I switched back to summer gloves and pried open the vents and zippers. The views atop the embankment over the river and urban sprawl were great with the highlight being the ridge of mountains to our right growing larger and closer. 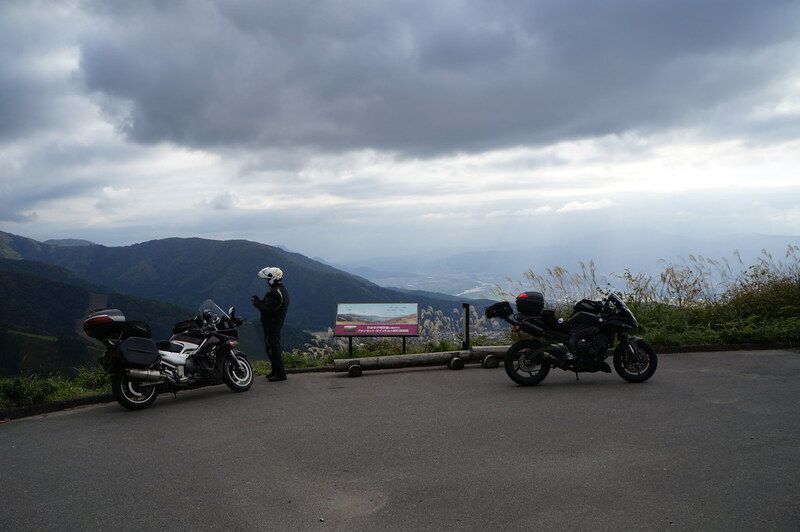 Somewhere up there was the Shiga border and beyond that a ways, Suzuka Skyline and a return to fun stuff! It wasn’t long before we escaped the burbs and were back on a road tracking a valley up into the hills. 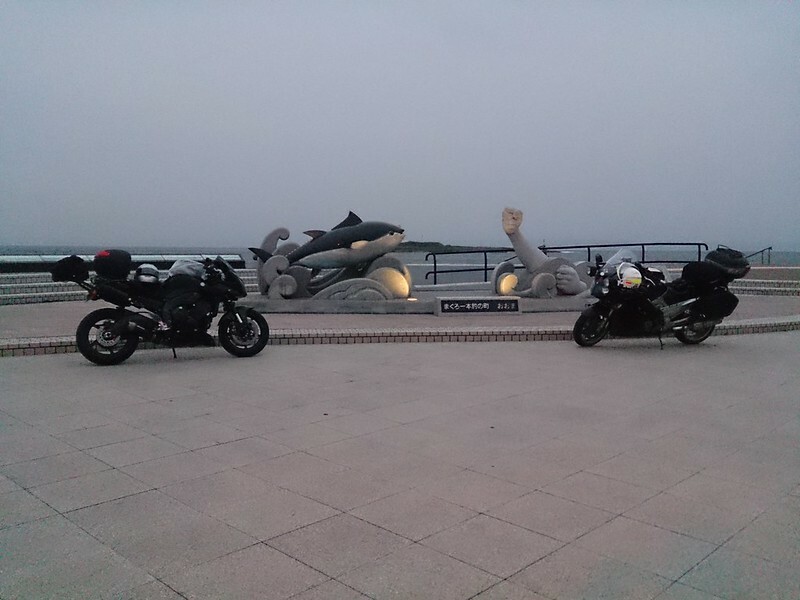 Had to stop for a couple of pics and say goodbye to the expanse of Nagoya and Isewan. From there we were southwest bound and the going was smooth so we made the Suzuka Skyline with enough light to enjoy it. Bit disapointed at the state of it though. It’s been several years since I was there and the surface has been let go. Too bad. Still a cool road though evidenced by the lack of pics. Yep, 19 litres in an 18 litre tank! 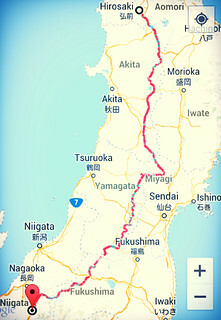 The Circle K was right by the Meihan so we jumped on that and the 370 down to Nara and onto the cherry of the night, Route 169 – Higashi-Kumano Highway. Obviously designed by someone who loves driving or at least understands that enthralled drivers make for alert drivers. Or it could all be a conspiracy by tyre, gas and brake manufacturers. Hehehe! In any case, its blend of dam/river-side snaking banked roller-coaster like roads and magic turbo-tunnels kept us rockin’ into the night. 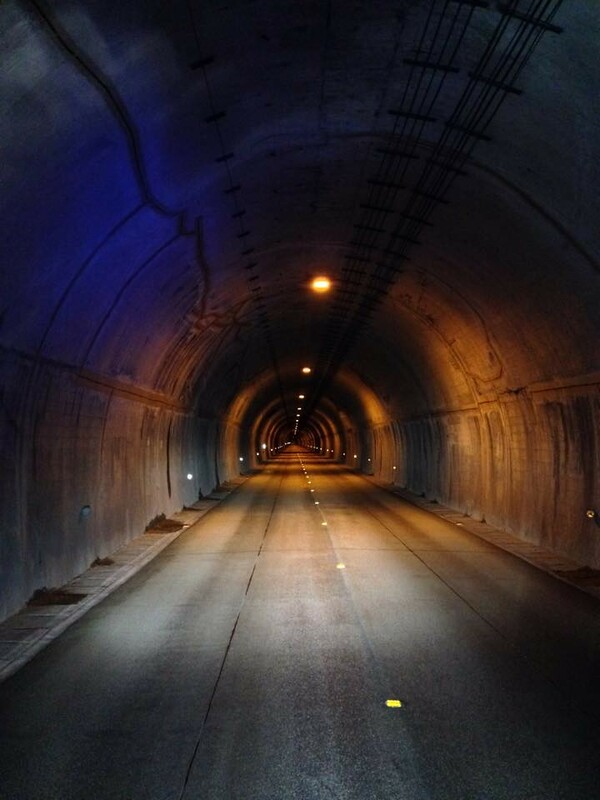 The night ride down Kumano highway was fantastic but the deer were everywhere. The doe were especially suicidally stupid … no carnage though due to James’ hard earned deerphobia. Tip-toeing our way down to the junction with rt309, we decided to get out of Deerville and head for the coast. It was getting late and we needed a room for the night. About then my wife called to see how we were doing. Explained we had just survived a fauna minefield and were going to stop for a bite on the coast and find a bed somwhere in Kushimoto. A few minutes later she called back with a room for us in Kushimoto. Golden! But, last check-in was 12 midnight. What better way to end the day than with a check-in run against the clock. Twisted down to the coast and stepped on it down a deserted coastal road. Things were going fine till we came upon a police blocked road. Lights flashing, stick twirling and all. Yep, thought for a bit we were done so ducked in behind a truck and skulked to a stop a dozen or so cars from the front line, out of sight. Unmounted and Pink-Panther like, snuck a peak around the truck to see if the fuzz were onto us. They weren’t so we took a stretch and chat time. 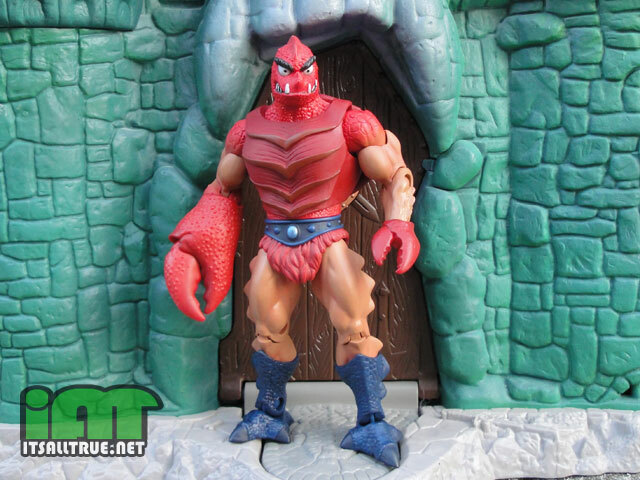 Good chance to temper James’ mutation, from the right wrist up, into Clawful! Must have surprised the growing number of cars behind us, James’ metamorphosis wasn’t that obvious yet but to see 2 foreigners pacing about puffin away and yabbering on in the middle of the road in a traffic jam. About then, an old guy stomped on by with a bee in his bonnet and after some waving arms and posturing with the cops, he was striding back. I ventured a what’s up? and he said there was a big accident blocking the road. We saw him firing up his k-truck and making a u-turn so the lids and gloves went back on and we were on the road again. A bit of k-truck chasing and back-street weaving later and we were back on that long coastal road against the clock. We rolled in to Hotel Seacans at 11:58! Proceeded to raid the local Lawsons for protein to compliment the impending beer carbs. Then got harrassed by a stupefied drunken local. 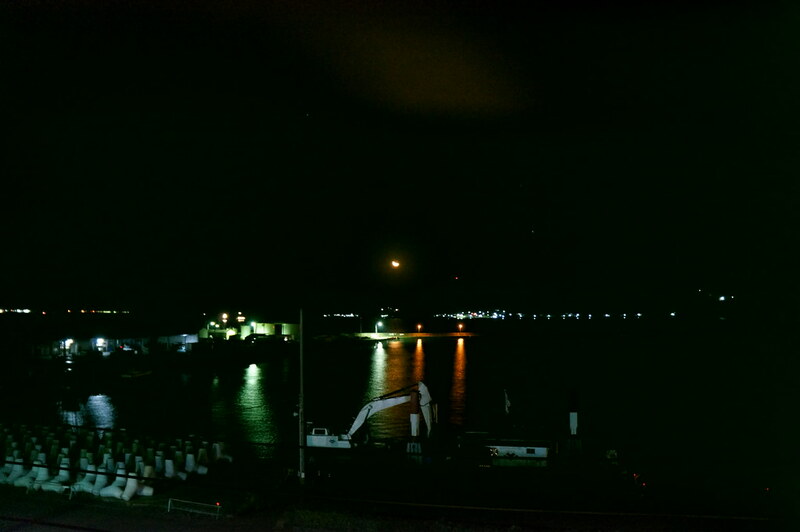 Didn’t slow our march back to a great feast and chat into the night with a view of the moon over the harbour and the waters of the Pacific. A hell of a day … we were back on track, time and distance wise. But J was still fighting the FJR hammer and tong to hang in there. But hanging in there they were. 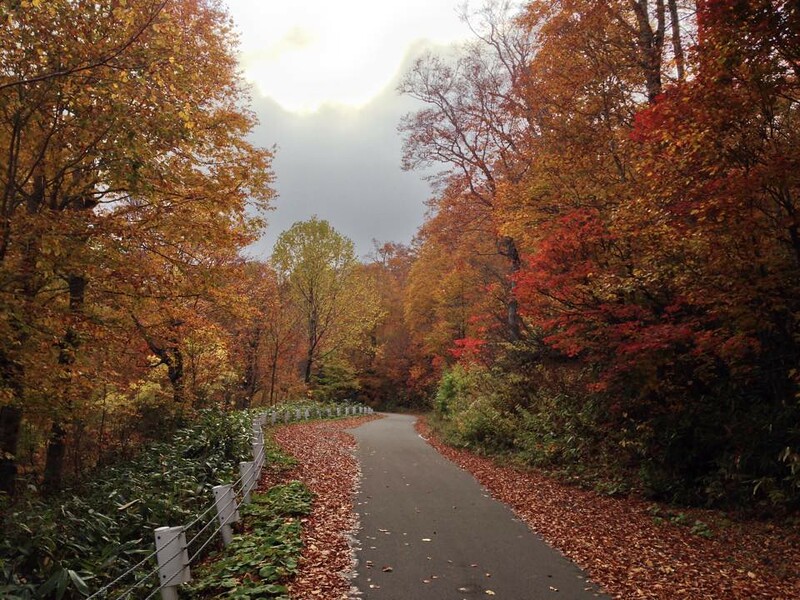 Good: The roads Weather Back to all day riding! 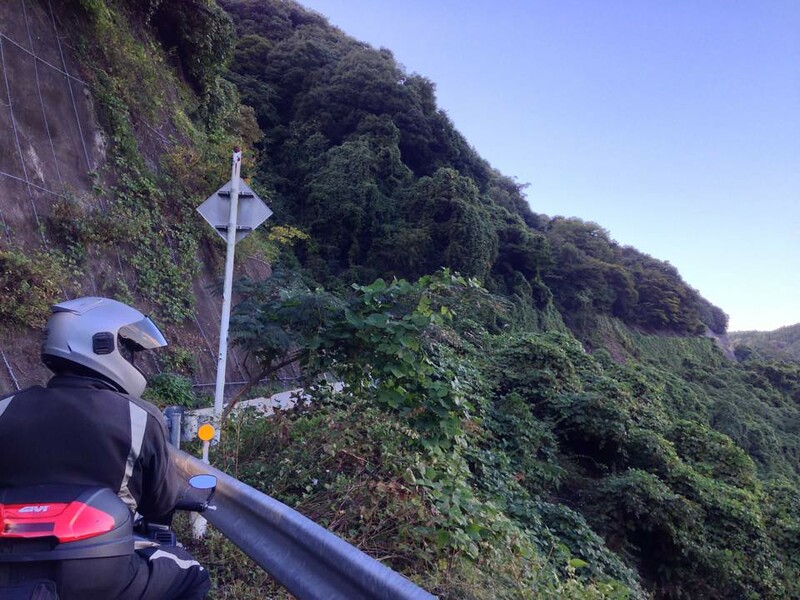 Day 6 – Is it possible to just ride out of Wakayama? 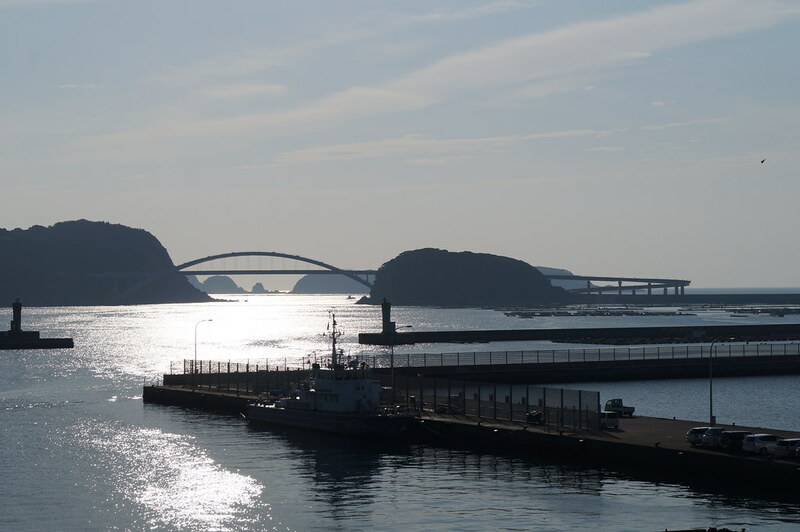 Pretty good feeling waking up after riding over halfway across the main island of Japan and knowing there’s still the other half to ride. Even better when you peel back the curtains and see your 1st got to do ride of the day. Looking back at the room only made it easier to get rolling. So, back on the road for day 6 and time to tick off a 3rd point then twist our way north, scrabble through Kansai and begin the run west. 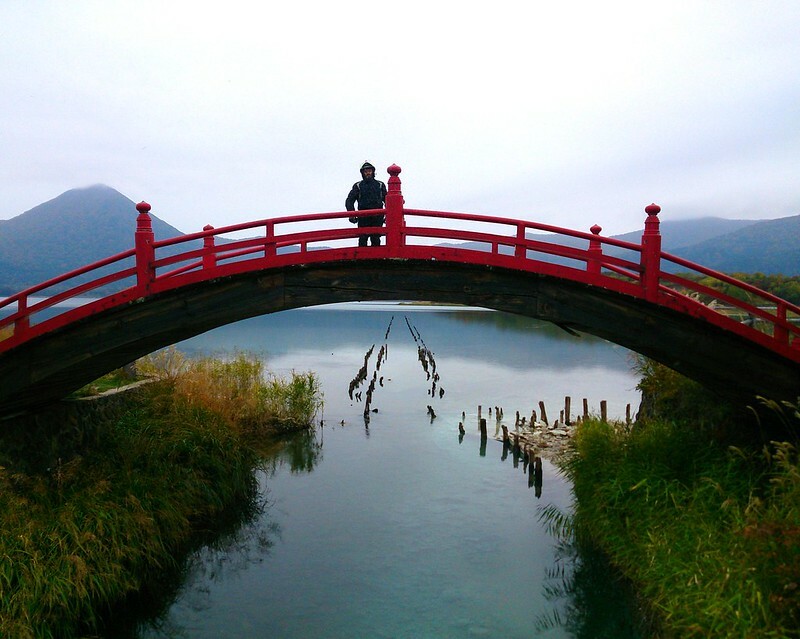 Seeing that fantastic bridge, we just had to have at it. 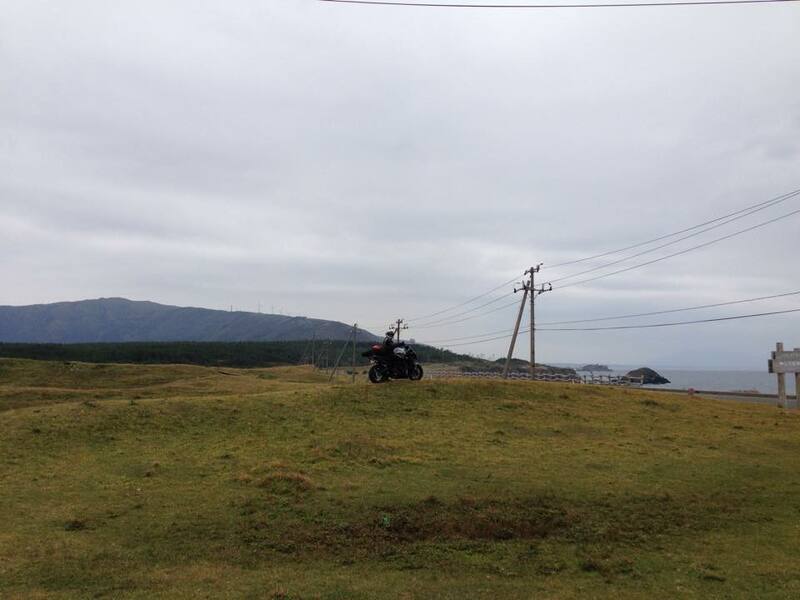 It took us over to Kii Oshima Island and a run up and over the central hillock. 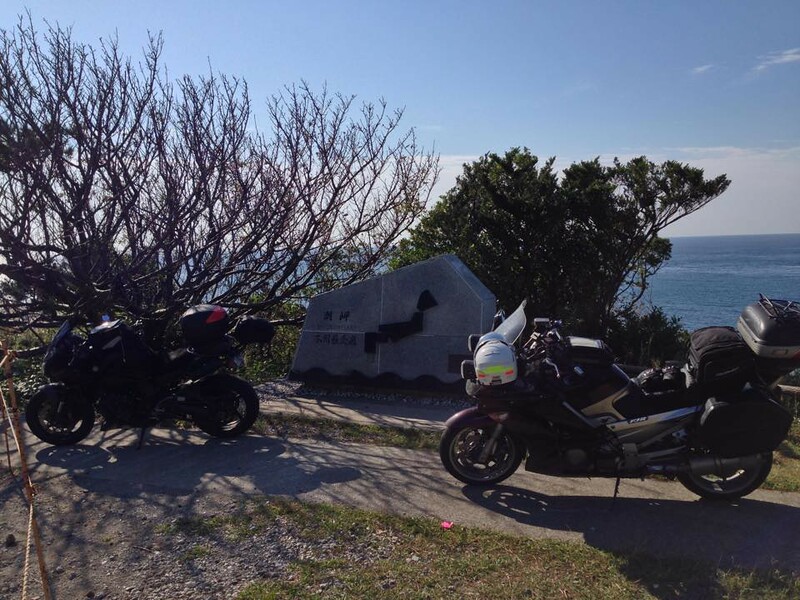 The best of the road done and the Southernmost point of Honshu calling, we turned around and rode back over the towering bridge and down the same 360 degree superloop. It was a worthy off route excursion. 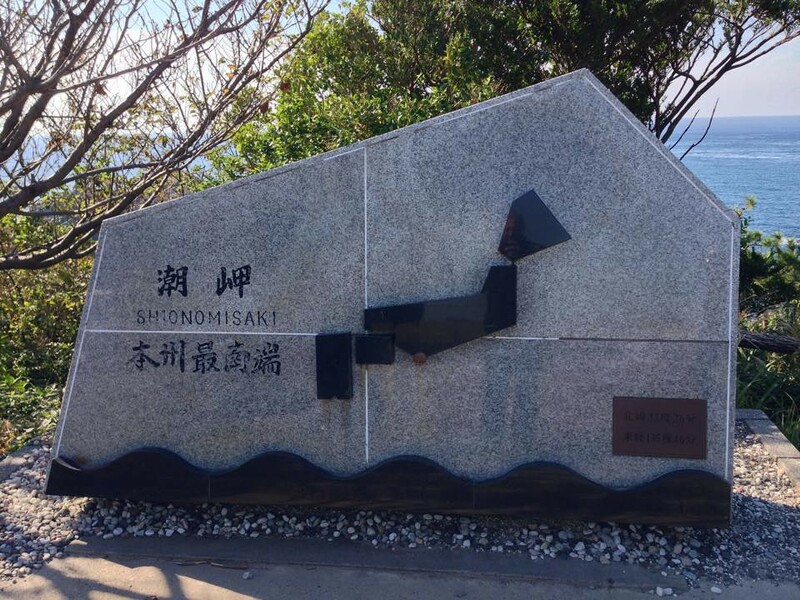 A short time later we reached Shionomasaki and ticked the 3rd and southernmost point of Honshu off the list.